I had written for fun in the past: started writing poetry at age 12 and continued to write short stories, a one-act play in college and T.V. scripts based on some of my favorite shows growing up; yet I never considered myself a writer. 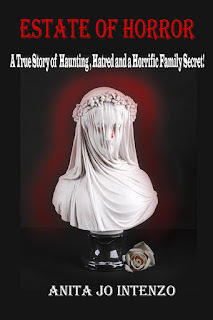 Even now, after completing the manuscript for my first book, Estate of Horror, the terrifying telling of my real-life encounters with ghosts after becoming the Executrix of a dear deceased friend’s estate in 2009, I don’t regularly think of myself as an author. This may seem strange that someone who is has a literary agent (a major coup) and submitting to major publishers, has a hard time considering herself an author. Before 2009, my background as a professional artist for the last 47 years, (sold my first oil painting at the age of 13), had always been my visual method of telling a story. But, after experiencing the unexplainable and the horrific ordeal with the paranormal at my friend’s home, I knew I had to record these extraordinary haunted experiences other than a daily diary. My son, and I along with other witnesses saw and heard on captured audio and visual equipment, extreme poltergeist activity, cold spots, black and gold orbs, an apparition, objects appearing and disappearing, nonhuman voices and physical attacks. When I first entertained the idea of writing a book, urged by my friends and family members after hearing of the unusual events happenings at the estate, I had no intention of writing it myelf. I felt if I provided the story and the materials, even possibly be interviewed, then someone else could do a better job. Having no formal experience other than a creative writing class in high school and a one-act play I wrote for a college assignment, ironically about a revengeful ghost (and by the way I got an A+) I was on the learning curve. I was also being haunted. After a grueling year of cleaning out his hoarder’s house, my deceased friend estate was sold to contractors, gutted, remodeled and resold, and many items that were left to me in my friend’s will, stored in my basement. This turned out to be a very bad decision, unknowingly to me. Someone or something transferred to my house and was now acting up with major poltergeist activity. My once safe haven, where I spent years as a single parent raising my son, where I worked in my art studio, enduring economic and personal hardship, and proudly taking care of it all, was now a battle ground for spirits. I felt that the best defensive was an offense and I decided that others needed to know what happened to me. After several attempts contacting “ghostwriters” several backed out after learning the nature of my real life ghost story, several were too cost prohibitive, I was left with the decision to write the book myself. In February, 2010, after being connected with a friend of a friend in New York, who was a former reporter and writer, I started to send one or two chapters a months to her for a look at the overall content, edit any glaring mistakes and dotting the i’s and crossing the t’s. She encouraged me that my writing “was not bad at all” and to continue to write to the end to which took 9 months and I completed my first draft of my manuscript, Estate of Horror. 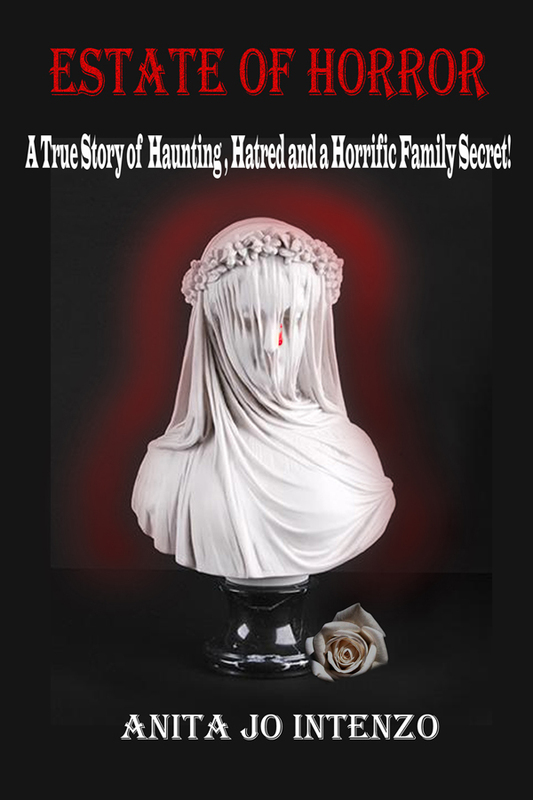 Estate of Horror’s structure didn’t rely solely on my diary entries or experiences; the chapters dealt with eye witness accounts, various people who encountered the poltergeist activity for themselves, EVP recordings, audio and visual evidence and secret documents discovered that had a profound effect on the overall mystery of why the house became haunted. My experiences with writing my book have been collaborative, and I attribute my successful completion of my book to not only myself, but to everyone who helped and encouraged me along the way; and the generosity of family members and friends who gave me permission to use their photos, experiences and testimonies included in the book. Twitter account, www.Twitter.com/past_images which has 1100 followers to date and I’m on the professional business network: www.LinkedIn.com/AnitaIntenzo. My agent told me before we started that today authors have to very pro-active in marketing themselves and her advice and my efforts have paid off. I have been interviewed on several internet paranormal radio shows including, PZTV’s Do You Believe with Norene Balovich (Aug 2012), and PSI FI Radio with S.J. Wells (Oct 2012), a joint interview coming up with renown author, lecturer and minister Bill Bean on KGRA/Project White Paper with Chase Kloetzke (April 2013), and Just Say’in It with Mary Gasparo of PEN network (June 2013). I also produced (out of my own pocket) a Book Teaser in July 2012. It is currently up on youtube.com http://youtu.be/kA2_q6GWJjQ using the many talents of family, friends and clients, and also used many props from the original Estate of Horror. While filming the teaser, the crew had some unusual experiences with tampered equipment, spirit orbs and other anomalies that showed up later in 8 photos on some of the production’s 100 still photos. It seems the spirits weren’t camera shy. My story isn’t over as my haunted journey continues. What was once a fairly normal life is now a paranormal life every day. Stay tuned and join me for more of my spirited blogs!